Benson Wanjau, commonly known to many as Mzee Ojwang’ Hatari passed on a few days ago leaving a legacy that will be passed to generations. I challenge anyone to mention any actor or comedian who was not influenced by Ojwang’ and I will certainly call you a liar. Churchil, Jalang’o, Eric Omondi and all those big wigs passed through Mzee’s hands. He was certainly a great mentor to many. I am only disappointed by the fact that he died a poor man and I strongly blame the government. He served and entertained us for years, both the citizens and the government, before his contract was permanently terminated leaving him with nothing to brag about. It’s so sad. The Vitimbi cast alongside other celebrities converged yesterday at Nyayo national stadium to rehearse ahead of Mzee Ojwang’s funeral. 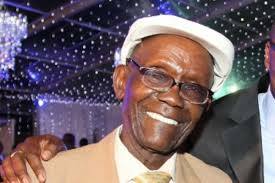 Mzee Ojwang will be laid to rest today at the Lang’ata cemetery. The legend will finally get eternal peace. He was certainly a good man, full of life, energetic and entertaining. We will miss you Mzee Ojwang’ Hatari.